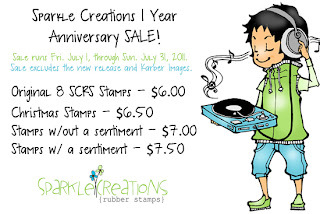 Sparkle Creations Rubber Stamps Challenge #53~Color Challenge! Play along with the sketch for your chance to win Swimming Lucy and Surfing Oliver! AND, you only have a few more days to take advantage of the amazing Anniversary Sale! Well, I have REALLY enjoyed my time with Sparkle Creations Rubber Stamps this month as the July Guest DT! You girls are amazing and it was a true honor to design along side you! Thank you so much for stopping by and have a wonderful Tuesday! Beautiful card, wonderful colours and a super cute image! Everything you make is a masterpiece! This is so sweet, love it! Mom got your darling card, thank you so much for putting a smile on her face, she loved it! 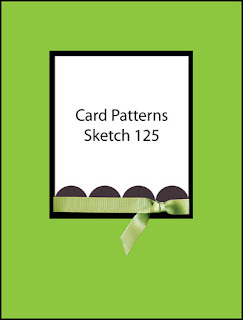 Wow Kerri this card is fabulous and that floral border punch looks terrific as a black accent! Adorable and so sweet. I love that punch or ribbon of the black flowers, very cool. Wow Kerri!How pretty!I love the colors and that image is sooo sweet!Your coloring is beautiful too! 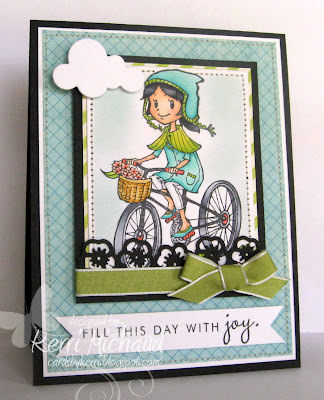 Your card is a new masterpiece everytime I visit your blog, Kerri! Love how you added flower border on this challenge card! SOOOO much fun!!!! LOVE this image Kerri, your coloring is FABULOUS! Just darling, Kerri! Love your take on the sketch and your coloring is fabulous! Thank you SO much for being our GD during our anniversary month! We appreciate all of your hard work and your out.of.this.world creations!